The cast of Jay & Silent Bob Reboot just got a whole lot more flashy, so to speak. Kevin Smith, as per usual, was on hand at San Diego Comic-Con to speak with fans in Hall H. During the course of his panel, the Clerks and Tusk director revealed that he's brought a trio of actors from The Flash TV series on board the cast for Jay and Silent Bob Reboot. That includes Grant Gustin, who plays Barry Allen/The Flash, Tom Cavanagh, who portrays Harrison Wells and Carlos Valdes, who plays Carlos Ramon on The CW series. Kevin Smith didn't reveal any specific details about their casting at the present time. So we don't know who exactly any of The Flash gang will be playing in the upcoming entry in the View Askew universe. It also isn't totally clear how large their roles will be. Are these merely going to be glorified cameos? Or will Grant Gustin perhaps have a more sizable part to play alongside Jason Mewes and Smith in the upcoming Jay and Silent Bob flick? For now, we're left to merely wonder. Jay and Silent Bob Strike Back, which was released in 2001, featured quite a few glorified cameos from the likes of Matt Damon, Gus Van Sandt and Mark Hamill, just to name a few. So it seems reasonable to assume that someone like Grant Gustin could fit the mold of a guy who could do something along those lines. Then again, just for a change of pace from playing a DC superhero on the small screen, he may do something way out of left field and take on a much larger role. Maybe he's going to play the rebooted version of Jay? Just a thought. 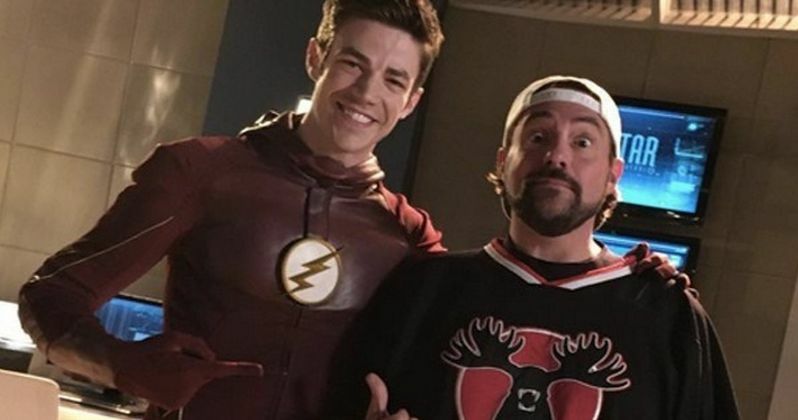 Kevin Smith recently took up directing episodes of TV shows and that started with him helming an episode of The Flash. He's directed three episodes in total, as well as a couple of episodes of Supergirl, which is how he got connected to the actors he recently hired for his latest movie. Jay and Silent Bob Reboot was initially announced in February 2017 and has been slowly coming together. In addition to these new cast members, it was previously revealed that Brian O'Halloran from Clerks will reprise his role as Dante, among others, in the movie as well. Jay and Silent Bob Reboot is just one of several movie projects Kevin Smith has in the works. He also has Moose Jaws, which is described as "Jaws with a moose" that will complete his True North trilogy, which also includes Yoga Hosers and Tusk. Jay and Silent Bob Reboot does not yet have a release date, but it's expected to begin filming in November. We'll be sure to keep you up to date as more details on the project are made available. This news was previously reported by Comicbook.com.